I was writing about hot pixels in a previous post. Now here is an example on how this looks like and why you don’t have to worry. When selecting a photo in Lightroom for the first time, you see a preview for a few seconds while the picture is being rendered. I snapped a screenshot of that moment. At this resolution you do not see much, so I have zooms in on the hotpixel… Now you can see a small red dot. The message “Daten warden geladen…” translates to “Loading data…” and means, that Lightroom is still processing the picture. For a clearer view I have yet another crop here. 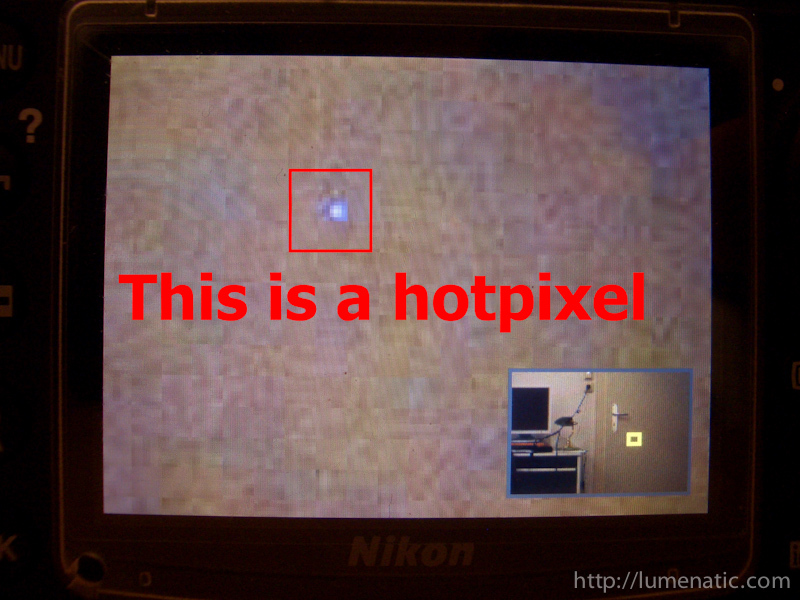 The hotpixel is clearly visible. The process of loading the data takes a few moments, and then the hot pixel is rendered away. To the left you see the zoomed image after rendering, and below that the content of the red box. And as you can observe – you see nothing. Hotpixel gone. All you see is the gloomy graininess of an image taken at ISO 1600. I told this to a friend of mine who is working in computer science. He is a very wise guy and pointed out, that there are two ways on how this could happen. 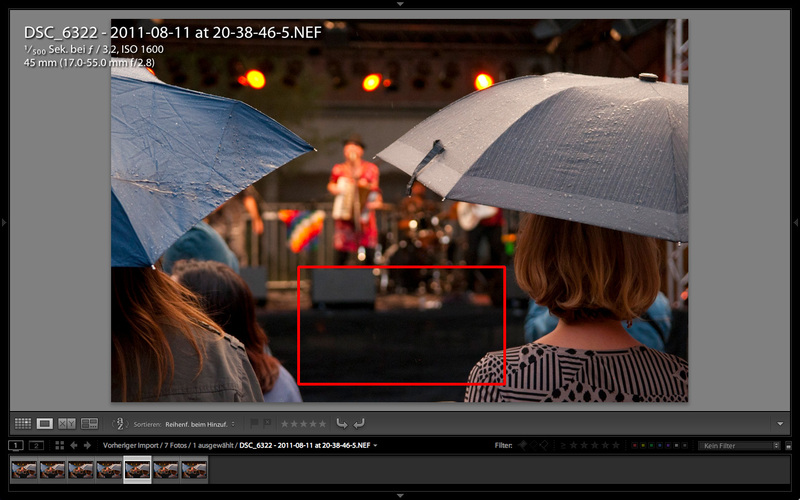 Either Lightroom is so smart and magics the hotpixels away, OR…. the Nikon camera stores a profile with the location of the hotpixels, which Lightroom can read and THEN magic the hot pixel away based on the profile information (The picture was shot with my friend’s Nikon D300). He never took his camera to the service, so is it really possible that Nikon makes a default hotpixel check with each camera produced and stores an individual profile on each camera…. is that realistic ? (That’s not a rhetorical question, I really don’t know). 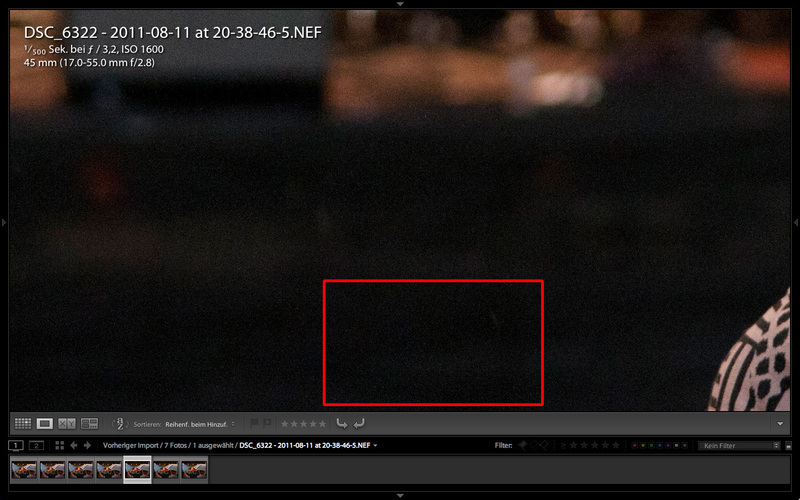 My guess would be that Lightroom detects the hotpixels. Considering the complexity of image processing algorithms today this is absolutely possible. Come on, have you ever seen content-aware fill in Photoshop ? That is on the edge of creeping me out. So my line of argumentation is as follows: If one Adobe product can make large objects in an image vanish like nothing was ever there, it should be no problem to detect and eliminate one pixel which colour does not match the surrounding colors. This is my interpretation, and I am open to be convinced of the opposite scenario (unique camera profile). In my case it does not matter how the hotpixels vanish. They just do, and that is a good thing. It is Lightroom, but it isn’t magic. Lightroom compares the pixel to those around it, and if just one pixel shows a variation in colour while the others don’t, it assumes it is bad and retouches it. Hi, I work with LR4 and it doesn’t map out pixels for me. It’s odd that one can find no information whatsoever if LR does have pixel mapping. Do you import RAW into Camera Raw first and then to LR? I import directly into LR and have to sort out the pixels which takes a long time. Someone mentioned LR5 has this feature. Do you know? I shoot raw and import the images directly from the camera in the native format (no dng conversion I mean by that). Are you applying any preferences to your images during the import ? If you import the images “as they are” the hotpixels might remain. That’s just a guess though. I never saw an option “hot pixel removal” or similar and I am not aware of LR5 having a dedicated hot pixel removal algorithm.